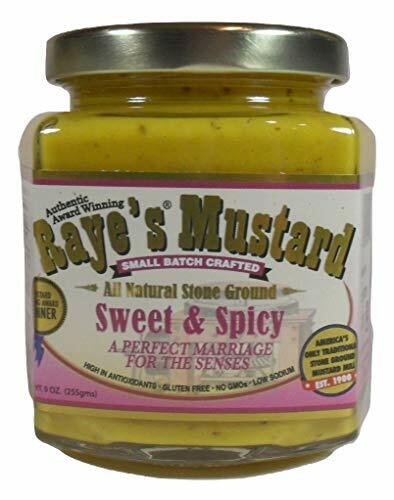 Enjoy Raye's Sweet Spicy Yellow Mustard (6x9Oz). Rayes Sweet & Spicy goes with everything! Spread it on smoked sausages before grilling or broiling them. Use Sweet & Spicy on fish for that added gourmet flavor.Straight out of the bottle it makes a wonderful dip for hors doeuvres. Add to meatloaf, mix with brown sugar, spread on corn beef or ham just before it comes out of the oven. Versatile and delicious!. Note: description is informational only. Please refer to ingredients on the product before use. Please address any health or dietary questions to your health professional before using this item.